We may not get to choose the bad surprises that befall us, but we definitely get to choose how we handle these experiences. If we use them as opportunities for personal growth, we'll always come out as winners. Two young women, Miss Colombia and Miss Philippines, recently experienced two different sides of a terrible shock. For Miss Colombia, it was the shock of being crowned the winner of the Miss Universe 2015 pageant and then less than two minutes later, having the crown removed from her head and placed on the head of the actual winner, Miss Philippines. I can't imagine how crushing the disappointment must have been, or the embarrassment. Just imagine if you had been announced the winner of a widely televised competition and had begun to celebrate your great victory, only to have it snatched away from you in front of the whole world, just moments later. Absolutely mortifying. It's one thing to hear that you're first runner up; it's another thing altogether to believe that you've won and then to discover that in fact, you haven't. It's a whole lot easier to accept your first runner-up status if you haven't had a moment to experience the thrill of victory. Once you've tasted the win, having it exchanged for a second place finish must be an unspeakable let-down. And then there is Miss Philippines, the rightful winner. She was deprived of the unadulterated joy of winning. 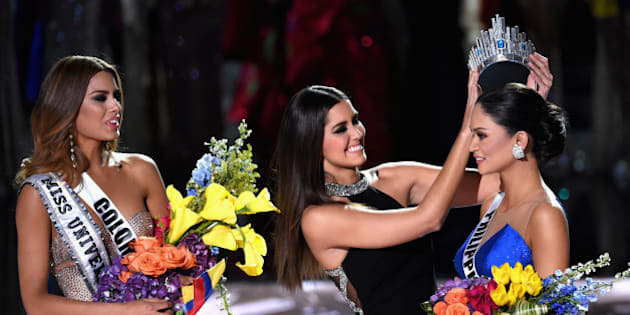 The shock and confusion of the whole mix-up, as well as her sympathy for Miss Colombia, must have made it very hard for her to enjoy all the special aspects of the win: hearing the announcement of Miss Universe 2015, receiving the crown and sash, and taking her victory walk. All of these experiences were tainted, because the crown and sash had to be torn away from a young woman she'd befriended. I imagine that her empathy and sadness for Miss Colombia must have made it extremely difficult for her to relish her victory. I can imagine that although completely innocent, it's entirely conceivable that she might have felt some guilt for her role in her friend's disappointment. That's no way to win any sort of prize. So, both of these women have been wounded by the experience. When they entered the Miss Universe pageant, they had no idea that Steve Harvey was going to make such a momentous mistake or that both women would forever be tied together as the two victims of this unforeseen event. Both women now have to recover from what happened. Miss Philippines, of course, will have the easier time of it. Although she'll never get to savour the simple joy of winning that every other Miss Universe, before and after her, will have gotten to experience, she'll at least be able to put the incident behind her and get on with her event-filled year as Miss Universe. I can assume that any guilt she might feel over this rather complicated victory would most likely be absorbed as the fact sinks in that she's the rightful winner, and as she gets caught up in the rush of exciting activities unfolding over the coming year. Miss Colombia, on the other hand, will get to spend some time contemplating the strange and painful events of the evening of December 20th, 2015. Her recovery could be more challenging, as she possibly will spend the next little while meditating on how such a thing could have happened to her. And that brings me to what I've been thinking about lately, which is how sometimes, life throws you some really odd curve-balls. Things happen that you never expected; never even could have imagined, and then you're faced with having to deal with them. Miss Colombia and Miss Philippines never could have imagined that this relatively innocent pageant could be such a source of discomfort for both of them. And yet, here they are, both having to contend with emotions that most likely, they never expected to feel in relation to this event. What makes all the difference, and separates the warriors and winners from the victims and losers in life is the attitude we bring to the painful surprises in life. Life is full of surprises; some of them wonderful, and some of them terrible. My suggestion is that when we're faced with painful surprises, it's best not to run away from what's happening. If we don't want to suffer more than absolutely necessary, it's preferable to stand and face whatever it is that we're experiencing. In that way, we become empowered to deal with these situations in the best way possible. We can let these experiences cause us to be demoralized, bitter, cynical or angry. We can become hopeless and overwhelmed, or we can face these difficult times with courage and optimism. We can look to make the tastiest lemonade possible out of the sour lemons that were handed to us. In my own life, I've chosen to see every painful experience as an opportunity for growth and learning. It's not that I'd choose any of these events. In fact, if I had the choice, I'd forgo every last one of them. Still, when they do happen, I always endeavour to make the best of them. In my life, when I experience an unpleasant surprise, I try to take away at least one or two life lessons. I also try to do what I call emotional alchemy; akin to turning lead into gold although in my case, I transform the energy of hurt or sadness into creative energy. When I'm faced with an unpleasant surprise, I choose to channel my pain into art. In this way, I feel empowered, as I was able to create something good and beautiful out of an experience that was brutal and painful. I'm hoping that Miss Philippines -- now Miss Universe, and Miss Colombia are both able to take advantage of the opportunity for growth and learning in this unfortunate experience. I'm hoping that they can use this moment of difficulty to discover things about themselves, the world, and life in general. And perhaps, they might even be able to channel some of their pain into their own version of creativity. If they're able to do these things, any feelings of victimization that they might have taken from this experience can be released, and they can emerge stronger, wiser and more resilient as a result of how they've handled this strange and uncomfortable surprise. And this suggestion applies to everyone who faces painful or difficult times. We can lie down and be defeated; we can become embittered and resentful, or we can become warriors in the face of adversity. We may not get to choose the bad surprises that befall us, but we definitely get to choose how we handle these experiences. If we use them as opportunities for personal growth, we'll always come out as winners.